Bitsheakers.utop.it is the PUP that uses misleading techniques to prevent removal. Use Reimage to locate malicious components and get rid of them faster than with uninstall instructions. A full system scan blocks virus reappearance and prevents traffic to malicious domains. How dangerous can Bitsheakers.utop.it virus be? If you are wondering whether Bitsheakers.utop.it virus is a legitimate alternative or a search engine that should be avoided, you should beware that it is a browser hijacker. This potentially unwanted program is programmed to hijack the start page, the default search engine and a new tab page. Moreover, it provides corrupted search results and threatens your privacy by collecting non-personally identifiable information. These are only minor disturbances in comparison to what this browser hijacker can do if it stays too long on your system. Therefore, you should remove Bitsheakers.utop.it from your computer, just like wow.utop.it and bnsearch.utop.it. If you have installed this browser hijacker after being convinced that it can boost up your browser, prepare for disillusionment. Bitsheakers.utop.it won’t speed up your browsing performance nor it will provide objective and relevant search results. On the contrary, it delivers sponsored third-party search targets which contain an amazing amount of highly intrusive ads. They masterfully distract your attention by popping up in every website you enter. Due to them, your browser struggles to open new tabs in a sufficient speed. Bitsheakers.utop.it redirect is another negative feature of this seemingly legitimate search engine. This browser hijacker doesn’t allow you to enter ad-free and objective websites. Instead, it redirects you to commercial, gambling or pornographic web pages. You should collect the remaining bits of your patience to escape the redirect websites since canceling them might require a considerable amount of effort. Moreover, despite their annoying behavior, those websites might be ominous regarding the petty viruses lurking in disguise there. After all, Bitsheakers.utop.it virus might cause further devastating consequences, so you should not delay its removal. For that, we highly recommend opting for automatic removal method, which can help you to make sure that your computer is totally fine. To remove Bitsheakers.utop.it with each of its components, use Reimage. It looks like scammers prefer initiating Bitsheakers.utop.it hijack via other legitimate and popular free programs. In other words, if you have recently downloaded a free Photoshop alternative, it is likely that you have installed this questionable search engine as well. You still can’t recall when it happened? Then try remembering whether there were any pre-marked add-ons placed under ‘Recommended’ installation settings. As a consequence, after you clicked on the ‘Install’ button, the hijacker was installed along with the downloaded application. If you want to escape such browser hijackers stepping in your system in the future, then we advise to develop a habit selecting ‘Custom’ installation and attentively unchecking the pre-marked programs. Otherwise, keep in mind that potentially unwanted programs might disrupt your browsing and even compile data about your online activity. In other words, they employ tracking technologies, such as cookies, to spy what websites you visit, how often you browse, what search entries you type in your browser. Consequently, the collected data might be transferred to third parties that may use it for their needs. Also, owners of Bitsheakers.utop.it browser hijacker may use this data to identify specific users’ needs and interests and then ‘manufacture’ relevant ads. To sum up, you should perform Bitsheakers.utop.it removal before it roots deeper into your system. You can try getting rid of this browser hijacker manually, but keep in mind that you’ll have to eliminate the additionally installed applications as well. Bitsheakers.utop.it virus and similar potentially unwanted programs mostly travel around in one pack with different files, add-ons and similar components that can be left behind if you use manual removal method to remove Bitsheakers.utop.it from your computer. 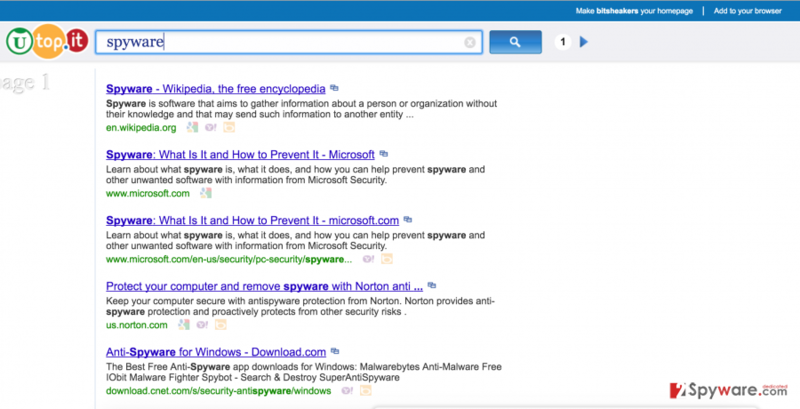 This may lead you to an increased risk of finding this hijacker on your browser again. As an alternative, you should remove Bitsheakers.utop.it virus using the help of an anti-spyware program. If you update it regularly, you can be sure that it will protect you from browser hijackers, trojans, viruses and other annoying malware. Here, look for Bitsheakers.utop.it or any other recently installed suspicious programs. Wait until you see Applications folder and look for Bitsheakers.utop.it or any other suspicious programs on it. Now right click on every of such entries and select Move to Trash. When in the new window, check Delete personal settings and select Reset again to complete Bitsheakers.utop.it removal. Once these steps are finished, Bitsheakers.utop.it should be removed from your Microsoft Edge browser. Here, select Bitsheakers.utop.it and other questionable plugins. Click Remove to delete these entries. Now you will see Reset Firefox to its default state message with Reset Firefox button. Click this button for several times and complete Bitsheakers.utop.it removal. Here, select Bitsheakers.utop.it and other malicious plugins and select trash icon to delete these entries. Click Reset to confirm this action and complete Bitsheakers.utop.it removal. Here, select Extensions and look for Bitsheakers.utop.it or other suspicious entries. Click on the Uninstall button to get rid each of them. Here, look at the Homepage field. If it was altered by Bitsheakers.utop.it, remove unwanted link and enter the one that you want to use for your searches. Remember to include the "http://" before typing in the address of the page. Now you will see a detailed dialog window filled with reset options. All of those options are usually checked, but you can specify which of them you want to reset. Click the Reset button to complete Bitsheakers.utop.it removal process. This entry was posted on 2016-04-01 at 09:33 and is filed under Stealing programs, Viruses. You can quickly scan the QR code with your mobile device and have Bitsheakers.utop.it manual removal instructions right in your pocket. How did you remove Bitsheakers.utop.it?